Intricate: what does it mean to you? Show us your interpretation. Once, while in Granada, Spain, I spent an afternoon exploring The Alhambra on a sunny spring day in the company of friends. We wandered for hours; we stopped occasionally to capture photographs and to marvel at the vistas, landscapes, myriad fountains, and gardens just awakening from winter in this ancient, historic place. Visiting The Alhambra is something I’ll never forget. To this day, when I think of the beauty and majesty of that massive palace, I wonder about the people who inhabited this stone fortress high on a hill above Granada, so many centuries ago. 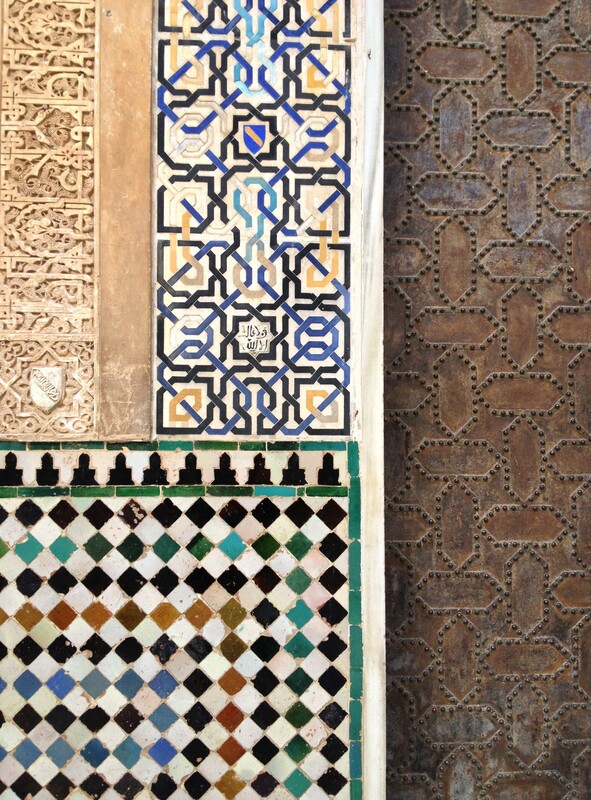 I think of the craftsmen who worked magic in stone, in metal, and in tile, in intricate color and texture. What does the word “intricate” mean to you? It could be the deep, fibrous bark on the ancient oak tree in your yard. Maybe it’s the robin’s nest under construction near your window — that ornithological engineering marvel of mud and twigs. It could be the treasured piece of needlepoint your grandmother crafted, or maybe a drawing you made. It could be the leaves falling from trees in the Southern Hemisphere — the wind arranging them just so on your lawn. Mmmmm, fun… Plus, Granada rocks! Thank you for another great challenge. Here is my contribution, this time straight out of Frankfurt, Germany. This is so beautiful.I’m looking at the details and how patiently the craftsmen created magic there. Thank you so much for sharing with us, Krista. Darn, I had a photo all picked out and I can’t make it fit intricately. Back to my digital shoebox. Intricate is the order of nature. Every simple leaf and flower has a mind-blowing intricacy to its design and structure. How this intricate structure of the nature that surrounds us could have evolved on its own is a humorous thought to me. I see the evidence of a Master Designer everywhere I look. The Morris Dancers and the May Queen showed off at the May Day Celebration intricate dance steps and costumes! Here are a few photos from my collection that speak ‘intricate’ to me. Subtle and yet somewhat artistic and confusing. Enjoy. Your post today reminds me of my time spent in Granada and in the Alhambra 3 years ago…it was a magical and mystical place! Definitely full of intricate beauty! I was agog at the majesty of the place — so incredibly beautiful. I had a wonderful afternoon there. Thank you! I was just waiting for the opportunity to use these pictures!! 785 Responses While this challenge is closed to new entries, we encourage you to visit the Reader to find other avid bloggers. Michelle Lunato Photography Peacock. Graceful, Elegant and Intricate. Raspberry's Daydreams One of the things we gave her..
Michelle Lunato Photography Spirit. Fill it With Hope, Love and Flowers. Capture Joseph Beginner here giving it a try! Which Way Now 101 It’s What? Nooo. North Kildare Cricket Lefties Unite!! Which Way Now 101 Hoodoo! not Whoohoo! Nuggets of Gold “Intricate” Weekly Photo challenge! life as seen by me Hope you chuckle too ! Roving Bess WPC – Intricate – An Awfully Large Eye-full of Eiffel. MINDING MY P'S WITH Q Photo & Phascination – Abstracts? Deb's world Weekly photo challenge: an intricate fish called Nemo! Cookie the Smelly Beagle :) Intricate: Brown meets black meets white!